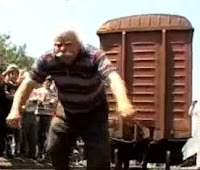 Russian Video: Record-Breaking Strong-Man of 80! This video can make you happy. I personally admire videos about old people who are in very good shape. This 80 years old man from Dagestan can do unbelievable things. Abdurahman can carry a railway car, lift more than 100 kilos by hands and shows incredible dental power! I am always very proud for such people! Such videos can really help you: When you watch such people you ask yourself if they can do it why I could not do at least half of it! Another my favorite person is Valentin Dikul. Read his unusual story here: Svet Sundays: Strong people of Russia – Valentin Dikul! This entry was posted in Documentary, Everyday Life, Wow on August 4, 2009 by admin.